Main subjects Media Studies, Theories of Mass Communication, Management of Creative Projects, Media Production, Digital Image Technology, Design of Multimedia elements, Popular Culture Production, Media Projects, Advertising, Visual Communication, Public relations, Creative Industries Studies, Sociology etc. Knowledge of main communication theories and the ability to apply them in a creative way, taking into consideration the peculiarities of communication services. Knowledge of business communication strategies and their application in creative communication projects. Knowledge of art and visual communication integration possibilities into the development of communication products for the media (Radio, Television, the Internet). Knowledge of information technologies and media possibilities in the development of communication products and services. The ability to carry out a preliminary research, purposefully choosing the optimal methods and tools; to analyze and publish research results. The ability to formulate and realize the communication solutions of particular companies, creatively integrating artistic tools, taking into consideration the needs of various audiences and target groups. The ability to initiate and implement creative communication projects both individually and in teams. The ability to convey information, integrating informational communication technologies and the media possibilities. The ability to communicate with both creative team members and society, when developing and presenting results of creative activities. The ability to take full responsibility for the quality of the creative projects participants' activity quality, in compliance with both professional ethics and citizenship. The ability to plan and organize one's own communication activities, taking into consideration the undergoing processes in the environment. The ability to foresee and assess the impact of one's own activities on the social, economic, cultural development. Students, who are willing to study in foreign universities, will have an opportunity to study abroad for one semester in the following countries: Spain, Germany, Italy, Poland Czech Republic, Portugal and others. CI study programme prepares specialists of creative industries "media" and "applied creativity" sectors (advertising, marketing, public relations, multimedia, television, film, press and other). 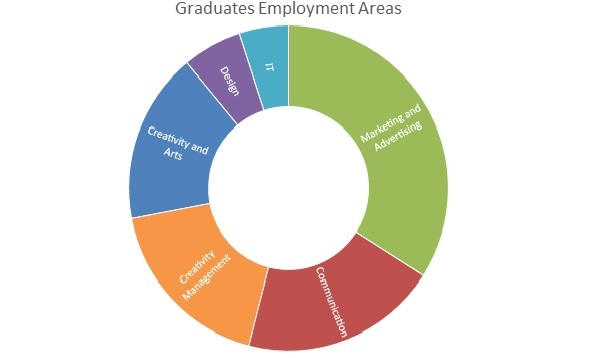 The bachelors of communication may be employed at the private enterprises that provide creative services: marketing, public relations, advertising, design, event organizing, culture and arts projects (television, video, internet, photography, music media, video games) as well as in marketing and public relations departments of various organizations.